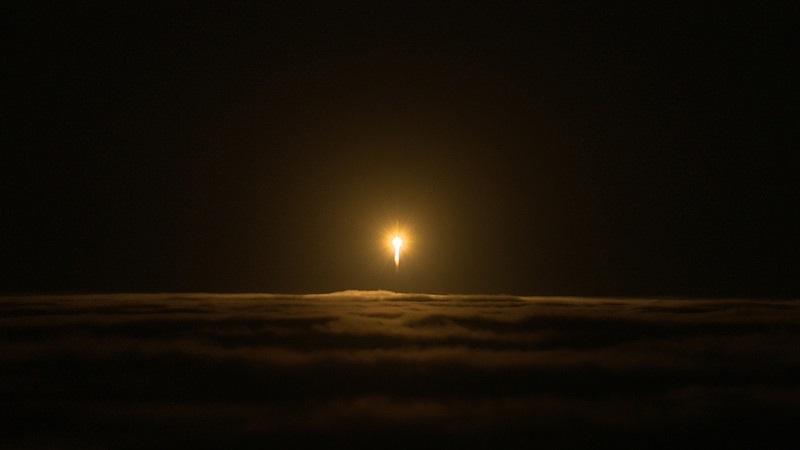 On November 26, 2018, the Mars InSight spacecraft became the ninth spacecraft to land on Mars’ surface, and 1 of 5 that are now active on the Martian planet. This is after almost 7 months and 300 million miles of interstellar travel from Earth to its new home on the red planet. The goals of this missions are many, but most have to do with looking into the past of this planet, and determining how rocky planets formed and evolved. The specific studies involved include understanding: 1) The size of Mars’ core, what it is made of, and whether it is liquid or sold, 2) The thickness and structure of the crust, 3) The structure of the mantle and what it is made of, 4) How warm the interior is and how much heat is still flowing through, 5) How powerful and frequent internal seismic activity is on Mars, and where it is located within the structure of the planet, 6) How often meteorites impact the surface of Mars. In order to answer these questions, there are three main instruments: 1) A seismometer, 2) A heat flow probe, and 3) A radio science experiment. The seismometer senses seismic waves to study the crust of Mars. Meteorites impacting the surface, magma moving at great depths, or movement along a fault can all cause seismic waves on Mars. Studying the crust of Mars with the seismometer tells scientists about the temperature, pressure, and composition of the stuff that first formed this rocky planet. 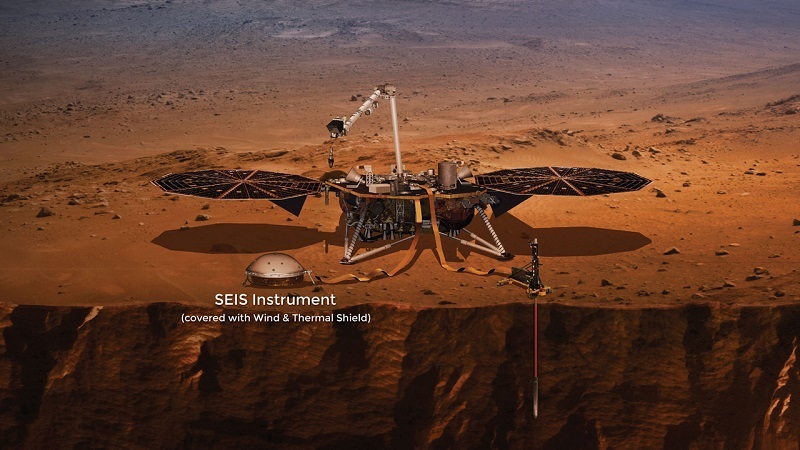 Image: Artist’s concept of InSight’s SEIS Instrument, which is investigating the seismic activity of Mars. The heat flow probe borrows deeper than any other scoops, drills, or probes on Mars before it. 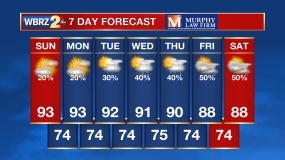 It will investigate how much heat is still flowing out of Mars. Its observations will shed light on whether Earth and Mars are made of the same stuff, and provide a sneak peek into how the planet evolved. 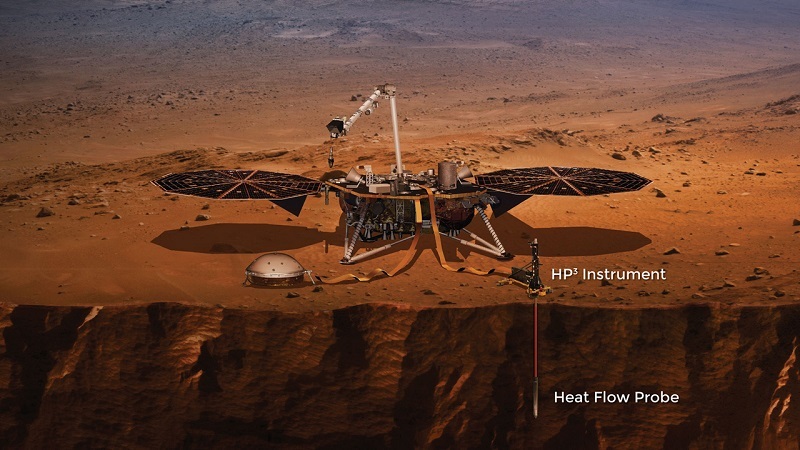 Image: Artist’s concept of InSight’s HP3 Instrument, which determines heat transfer within Mars’ core. The Radio Science Experiment measures the slightest changes in the location of the lander to reveal how Mars is moving in its orbit. 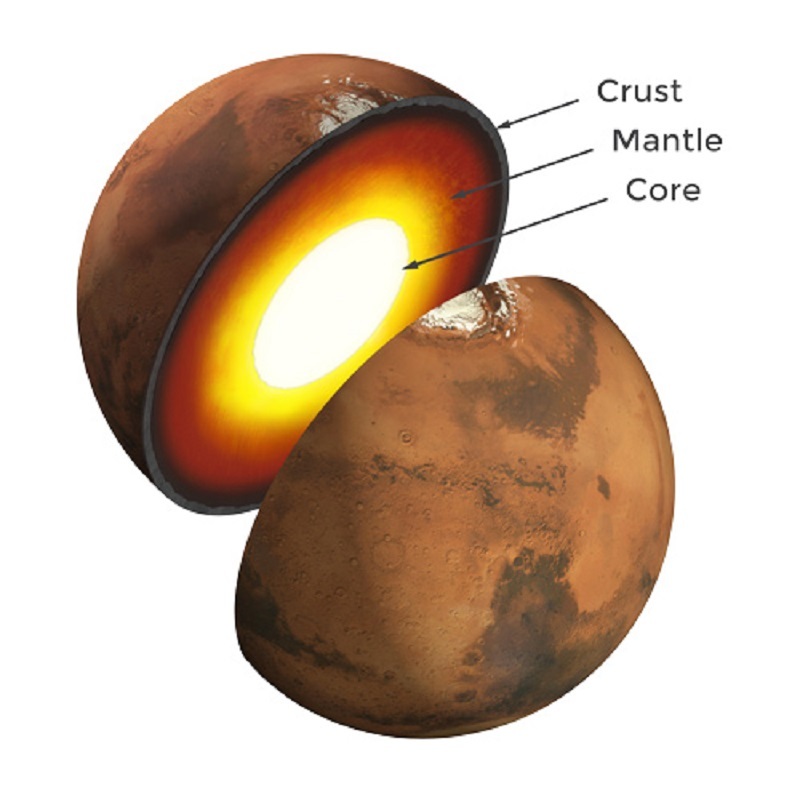 These measurements provide information on the nature of Mars’ deep inner core. They uncover the depth at which Mars’ core becomes solid, and what other minerals, besides iron, may be present. Image: Artist’s concept of InSight’s RISE Antennas, precisely tracking the location of the lander to determine Mars’ wobble. Mars has always been a tough challenge to orbit, land, or rove since the first mission back in 1960. The overall success rate of 51% for Mars missions is not comforting, until you break it down by countries. USA has had an impressive record, only failing on 5 out of 22 total Mars missions. Russia, on the other hand, has experienced quite a difficult time, with only 3 successful missions out of 18. That gets even worse when observing rover or lander missions, with Russia not being able to complete any attempts out of 6; USA has been almost perfect in this department, with only one mission failure out of ten. The reason it is such a tough task, is because Mars has an incredibly thin atmosphere. This atmosphere is only 1 % of Earth’s, which means that there is very little air friction in order to slow down the spacecraft. 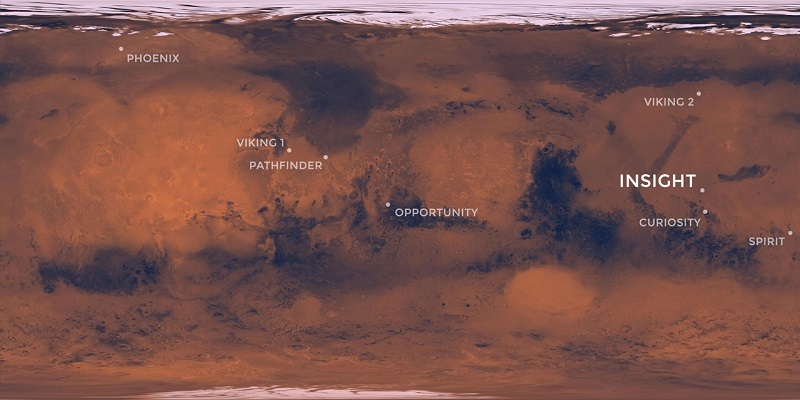 Image: Map of all successful spacecraft landing on the surface of Mars. 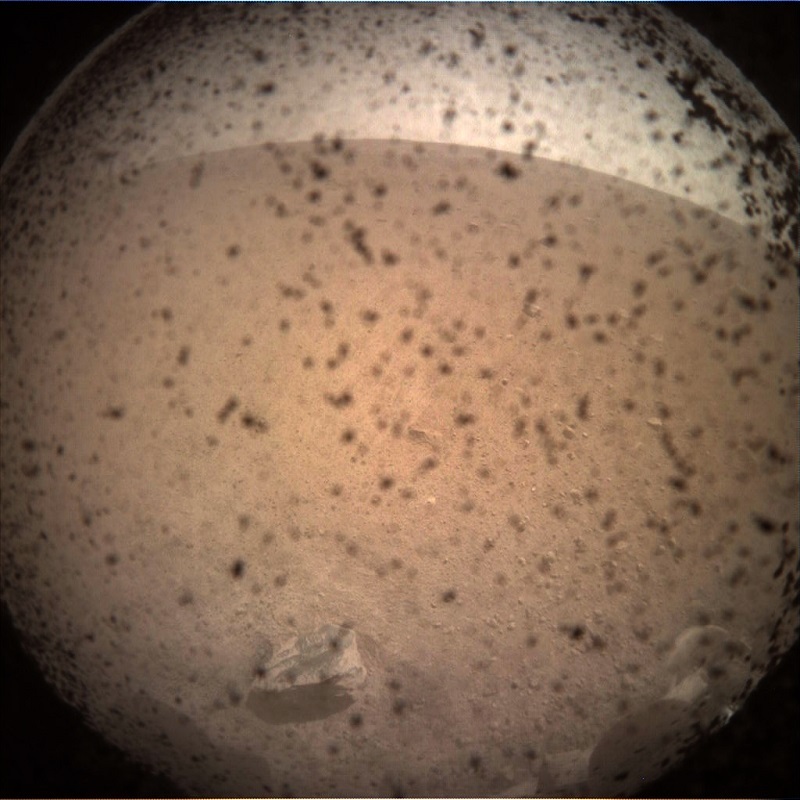 Image: InSight’s first image from Mars. Image: Artist’s rendition showing the inner structure of Mars. The topmost layer is known as the crust, underneath it is the mantle, which rests on a solid inner core. When it comes to rocky planets, we’ve studied only one in detail: Earth. By comparing Earth’s interior to that of Mars, Insight’s team members hope to better understand our solar system. What they learn might even aid the search for Earth-like exoplanets, narrowing down which ones might be able to support life. So while InSight is a Mars mission, it’s also much more than a Mars mission. InSight will operate for 728 days, but it is likely to outlive this initial lifespan – much like its predecessors.